Crustaceans, including crabs, lobster, crayfish, shrimp and prawn, commonly appear on dinner plates and in side dishes in many regions across the US and around the world. But for some, crustaceans can induce a severe allergic reaction. According to F.A.R.E, 1.2% of the US population have a shellfish allergy. An allergy to one kind of crustacean is likely to induce reactions to others since there is extensive cross-reactivity. There is an additional risk of cross-reactions to insects like cockroaches, midges, and mites. Cross-reactions to molluscean species, brine shrimp, and fish parasites like the cod worm have also been observed. What is the root cause of a shellfish allergy? Crustaceans have one muscle protein in common: Tropomyosin. This protein has been identified in 21 crustacean species and is responsible for most of the allergic reactions. While shellfish allergy can appear in children, it is more likely to manifest in adults. Unlike some of the other Big 8 allergies, children don’t outgrow it, and reactions tend to worsen with each exposure. Approximately 60 percent of people with shellfish allergy experienced their first allergic reaction as adults. 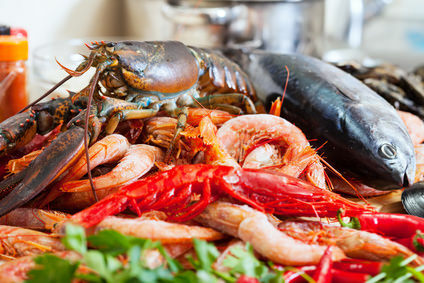 Shrimp, crab and lobster cause most shellfish allergies. What foods can present a potential hazard? What are some unexpected foods where Crustaceans can be an ingredient? Shellfish fall into two different groups: Crustaceans (like shrimp, crab, or lobster) and mollusks (like clams, mussels, oysters, scallops, octopus, or squid). Some people with shellfish allergies are allergic to both groups, but some might be allergic only to one. Allergy to iodine, allergy to radiocontrast material (used in some radiographic procedures), and to crustaceans are not related. The widespread occurrence of Tropomyosin in other invertebrate species can cause Shellfish Allergic individuals to also react to non-dietary invertebrates (e.g. house dust mite, cockroach). The word Crustacean is the contemporary usage of the word Crustacea. Note! Unlike shellfish, mollusks are not considered major allergens under FALCPA. Manufacturers are not required to disclose their presence as an ingredient on a product label. The test is applicable for qualitative detection of target antigens in the samples of complex foods and surface swabs. The sensitivity of the test may decrease in case of heat-processed food or fat-rich samples (e.g. in presence of oil or cream). Some fish processing technologies, eg preparation of surimi, selectively deplete the antigen (tropomyosin), sometimes resulting in weak positive or even false negatives.